Two competing forces defined the Astoria waterfront throughout the nineteenth century. Wealthy New Yorkers built grand estates and stately summer homes along the shoreline. Meanwhile, factories, warehouses, and chemical plants on the Queens waterfront fueled the growth of a rapidly developing city and drove people away from enjoying time on the waterfront. These waterfront villas, built in Ravenswood during the 1800s, were abandoned and crumbling a hundred years later. Courtesy of the New York Public Library. Old Astoria Village would remain a quaint farming town until a wealthy fur trader named Stephen Halsey arrived in 1835 with big plans for development. He began to transform Old Astoria Village into a bustling town complete with new roads, houses, stores, churches, schools, and factories. He also bought and modernized the existing ferry service to Manhattan, moving it to Hallets Point at the foot of Astoria Boulevard. Stephen Halsey, often viewed as the Father of Astoria Source: J.S. Kelsey’s History of Long Island City New York. 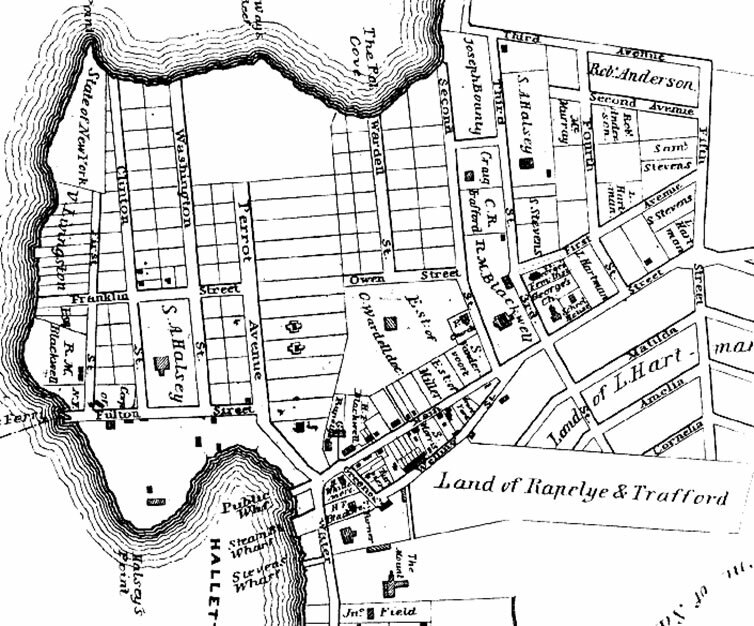 By 1839, Halsey had decided that the area needed a new name. Halsey had connections to the biggest fur trader of the time, John Jacob Astor. 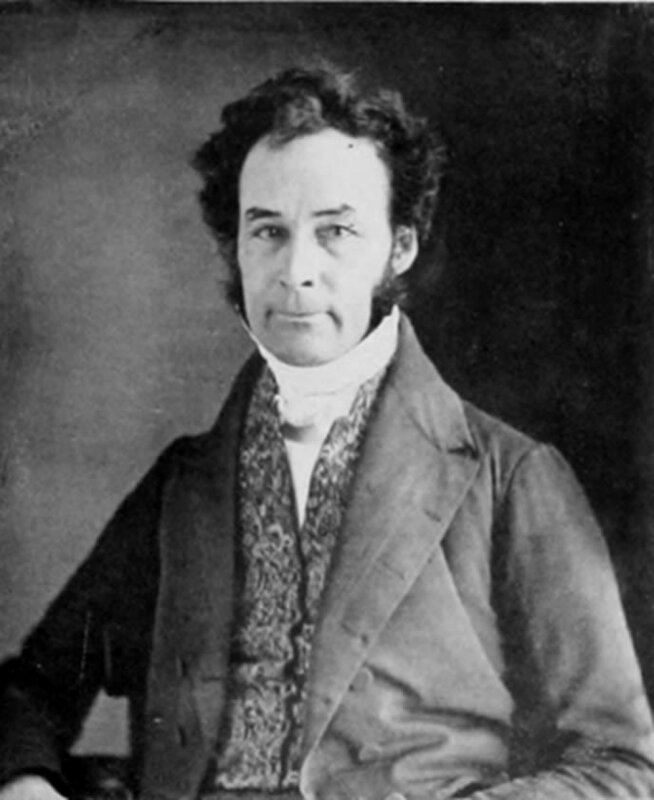 He proposed that Astor donate $2,000 towards the construction of a new Episcopal female seminary in exchange for naming the village after him. Astor only offered $500, but the money was eagerly accepted and the village was officially named “Astoria,” much to the dismay of most residents who favored keeping “Hallets Cove” or calling the village “Sunswick,” a Native American name for a creek running along present-day 21st Street. The building that Astor funded eventually went on to become the rectory for St. George’s Church . In 1840, the New York Legislature officially incorporated the village under the name Astoria. 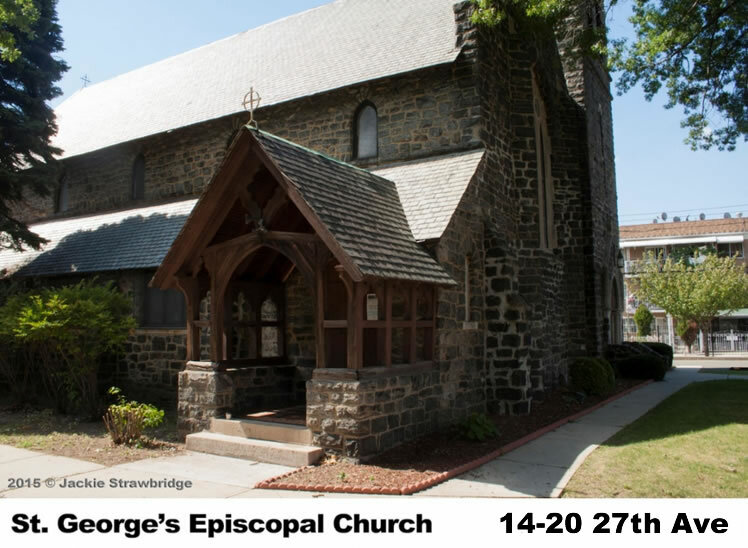 A donation from John Jacob Astor helped build the rectory at this Astoria church. But by the 1860s, the bucolic mansions began giving way to industry. 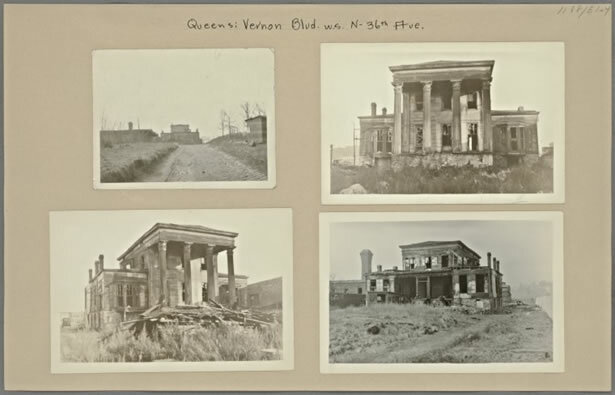 As New York City and Brooklyn adopted more stringent regulations, Queens—which was still made up of independent towns and villages with fewer rules and cheaper land—became an attractive site for industry. Distilleries, varnish factories, chemical works, and oil refineries sprung up along the waterfront. Factories, farmland, and mansions all kept the Astoria waterfront busier than ever. Commuters travelled both ways, with ferries bringing wealthy bankers and lawyers from Astoria’s mansions to their downtown offices and then returning with immigrants who lived in Manhattan’s tenements and worked in Astoria’s factories. Dozens of docks served the area’s factories and plants, as raw materials and finished products were shipped in and out on barges. Farmers on their way to sell their crops in Manhattan, workers at the Steinway Piano Factory and other new enterprises, and a growing number of residents traveled to and from the Astoria ferry on horse-drawn carriages, stagecoaches, and later, trolley cars. Travelers often stopped to shop or have a drink along the way and a growing number of inns, stores, and taverns opened up to cater to them. Astoria Square, bounded by the present-day intersections of 21st Street with Astoria Boulevard, 27th Avenue, and Newtown Avenue, grew into a busy junction and the unofficial entrance to Astoria Village. An 1885 photograph shows Moritz Albert’s Saloon at the corner of Astoria Boulevard and Newtown Avenue. A sign in German advertised wine and beer. The Red Tavern, housed in an old colonial mansion, was another popular watering hole. When the “old Astoria Hotel” on Hallets Point was demolished in 1939, Astoria old timers recalled that it had once been “a resort out in the sticks” known at various times as Corey’s Hotel, Kenney’s Inn, and Christy Arnold’s. The Manhattan Cocktail was said to have been invented at the Red Tavern, a nearby bar in an old colonial home, as people endured an especially long wait for the tides to turn and the ferry to resume running again. 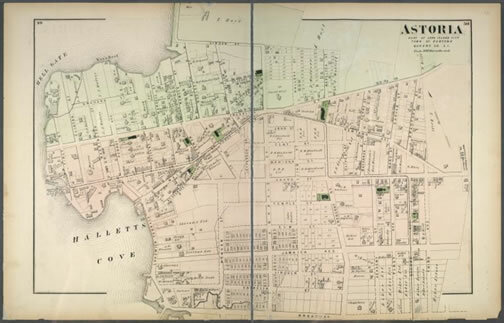 This 1873 Beers Map of Astoria shows how rapidly the village grew after being incorporated. Courtesy of the New York Public Library.